This article is about the feature film. For the film footage of the purported alien autopsy it was based on, see Alien autopsy. 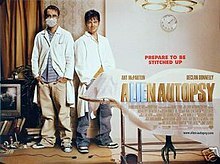 Alien Autopsy is a 2006 British comedy film with elements of science fiction, directed by Jonny Campbell. Written by William Davies, it relates the events surrounding the famous "alien autopsy" film promoted by Ray Santilli and stars Ant McPartlin and Declan Donnelly, also known as Ant & Dec. The film was a moderate commercial success domestically, making no. 3 on the British box office chart. The film is framed by Ray Santilli and his friend Gary Shoefield retelling the events to a documentary maker. In 1995, Ray and Gary go to America to find Elvis memorabilia to sell on the market stall Ray runs in London. A former US Army cameraman, Harvey, sells them a silent black and white film of Elvis performing live, but later return with an intriguing offer. Harvey takes Ray to Miami, Florida to see a film from 1947 showing the autopsy of an alien supposedly killed in a UFO crash in Roswell, New Mexico. Harvey wants to sell the film for $30,000. Gary and Ray return to England to look for an investor to give them the money. Ray convinces Laszlo Voros, a Hungarian art dealer obsessed with crop circles, to give him the $30,000 and retrieves the film from Harvey. Back in England, the pair discover that the film has degraded from humidity and heat and is now completely unwatchable. In order to avoid serious repercussions from Voros, they decide to make their own recreation of it. They base the content on Ray's memories of the original, and, with the help of some friends, fashion a convincing replica of the dead alien using a mannequin and meat products obtained from a friend's butcher's shop, turn the living room of Gary's sister into a film set, and shoot the film on a Bell and Howell spring-wound camera. Ray gives a copy of the final product to Voros, who believes it to be real. Having convinced Voros, Ray and Gary decide to sell the film to other venues, earning them a large sum of money. However, when Voros hears about its international distribution, he demands 80% of the profits. A potential clash is averted when Voros is killed by a green Land Rover while standing naked in the middle of a crop circle, leading to speculation that he has been killed by a CIA agent. Ray and Gary travel to Argentina to promote the film, followed by reporter Amber Fuentes, who seduces Ray. She eventually tracks down Harvey, who demands from Ray and Gary that they maintain his anonymity. To fulfil this obligation, they produce an interview with a homeless former actor playing Harvey, which convinces Amber. She remains sceptical, however, about the film's authenticity. Ray and Gary are now persuaded that some of the original 1947 footage might actually be recovered by film restoration experts in order to be viewed. However, after viewing the results, the pair bury the film, telling each other that they cannot continue with the endeavour. The film also contains brief appearances by Ray Santilli, Todd Sherry and Gary Shoefield. The film received mainly positive reviews earning a 71% approval rating on Rotten Tomatoes. The film was released as a Region 2 DVD by Warner Home Video on 3 July 2006. In America, the film was released as a Region 1 DVD by Warner Home Video on 21 September 2010. Stakka Bo – "Here We Go"
The Monkees – "I'm a Believer"
Stereo MC's – "Step It Up"
Tom Jones – "If Only I Knew"
Nouvelle Vague – "Just Can't Get Enough"
Son of Dork – "We're Not Alone"